The definition of a hero is generally a person or figure, who is admired or idealized for their courage, outstanding achievements, or noble qualities. As a Philadelphia sports fan my entire life, I have had plenty of opportunities to pick who this person was for me growing up. There was the hard-hitting but well-spoken Brian Dawkins of the Eagles, that truly left everything he had out on the football field on Sunday’s. He set the tone on defense for a team which reached the Super Bowl in 2004. There’s the great Chase Utley of the Phillies. He helped win the city its first major sports title after a 25-year drought and defines the word toughness on the baseball field. Then there was the great Eric Lindros for the Flyers. He led the team to a Stanley Cup in 1997, before they were ousted in four games by the Detroit Red Wings. He was a scoring machine who is already in conversation to become an NHL Hall of Famer, just a few years out of the league. All were or are still great athletes and at one point or another were considered the best at their respective positions. But football, baseball and hockey didn’t nearly pique my interest in the way that basketball did when I was growing up. When a little guard from Georgetown first stepped on the court for the Sixers, I knew that there was only one guy to take this title from me. My hero was the man who donned No. 3 on his chest, had a pair of sweet Reebok sneakers on his feet and lined himself from head to toe with tattoos and accessories. My hero was Allen Iverson. In my lifetime, I’ve only experienced this feeling from Iverson. In all my years of sports writing, this is an article that I’ve always wanted to write but one that I didn’t know how to start and didn’t know where it would end. Now I know. Iverson is finally giving it up at 38 years old. He told SLAM Magazine on Thursday that he was announcing his retirement after three years of trying to fight back into the League for an NBA roster spot. It didn’t happen. Instead of berating the man for his mistakes off the court, embrace him for the player he was on it. When it’s all said and done, for good or for bad, Allen Iverson might go down as the most influential Sixer of all-time — with all-due respect to Dr. J.
I’ve avoided writing this piece all together, because there is so much to write about the man for both good and bad reasons. The closest I’ve come to any sort of story for this site on Iverson, was my review of the ESPN 30 for 30 documentary on the man, “No Crossover: The Trial of Allen Iverson” back in 2010. But lets leave the bad behind for now and focus on the greatness the man possessed within himself as a basketball player. First lets start with the trophies. He was the 2001 NBA MVP, he was an 11-time All-Star, he won four NBA scoring titles, he was a part of three NBA First Team’s and Second Team’s and won the 1997 NBA Rookie of the Year Award. During his career he amassed 24,368 points (19th all-time), 1,983 steals (12th all-time) and 5,624 assists (38th all-time). He’s one of just seven NBA players to ever score 24,000 points while dising out over 5,000 assists in their career, the others go as follows: Oscar Robertson, Jerry West, John Havlicek, Kobe Bryant, Kareem Abdul-Jabbar and Michael Jordan. In terms of averages, his 26.7 points per game comes in at sixth all-time and 2.17 steals places him in eighth. In the playoffs those numbers only get better as he sits in second behind only Michael Jordan with 29.7 points per game, seventh in steals with 2.07 a game and 32nd in assists at 5.99 a contest. For a player his size at 6-feet tall (a record height which still stands in terms of No. 1 draft pick’s) Iverson accomplished an unfathomable amount of milestones during his NBA career. It’s a career which the majority of people who follow the NBA closely would say ended too soon. 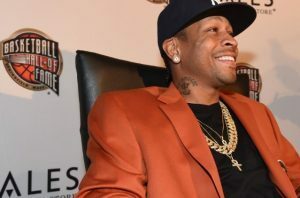 From the years 2008-2013, Iverson could’ve further added to both his legacy and ranking amongst the NBA’s greats, but his troublesome life outside of the game and attitude towards playing the role of an aging player in the League left the ending to Iverson’s career in the same way that it started — as a question mark. When Iverson was on the court displaying his god-given talent, he was always “The Answer”. From the first Sixers playoff game I witnessed live — Iverson setting an NBA playoff record in steals with 10 to go along with 33 points in an 97-85 win over the Magic — to the final game in Iverson’s career I got to witness live — Iverson going toe-to-toe with rival Kobe Bryant one more time, finishing with a season-high 23 points in a 99-91 loss to the Lakers — Iverson showed the same heart, courage and drive on the basketball court which had driven him to so much success in the NBA. His lightning quick speed, dazzling crossover, pure jump shot, acrobatic drives to the tin and endless courage are what made him so beloved amongst basketball fans throughout the world. Then there was his style. He made tattoos and cornrows a standard in the NBA during his time in the League. It was almost as entertaining to watch a Sixers press conference following a game then the actual game itself just to see what threads Iverson decided to go with this time. On the court he wore many armbands, usually one which had “The Answer” written across it, a white or black arm sleeve on his right arm, a couple of No. 3 finger bands and of course his signature sneakers. He made the perfect NBA action figure for any child. There are so many great Iverson moments which stick out in my mind. There was the sick putback he had against the Raptors, the crossover and bucket against Michael Jordan, his behind-the-back fake and bucket, dropping 60 against the Magic and of course the infamous “practice” rant. Yet, the 2000-01 season for the Sixers was the highlight of Iverson’s career and the highlight of the Sixers as a franchise over the past 25 years. After Allen was announced as MVP after leading the Sixers to the best record in the NBA at 56-26, Iverson went out and simply dominated Vince Carter and the Raptors in Game 5 of the playoffs. He scored 52 points and brought the Sixers within a game of the Eastern Conference Finals. When the Sixers later advanced to face the Bucks, Iverson’s name was called again in Game 7 to get the Sixers into the NBA Finals and he didn’t disappoint. Iverson dropped 44 points, clearly grimacing at various points of the game from injuries he suffered during the playoffs, and brought the Sixers back to the Finals for the first time since 1983. Then there was Game 1 of the 2001 NBA Finals. This game will go down in history as Iverson’s greatest game. Facing the defending champion Los Angeles Lakers with Shaquille O’Neal and Kobe Bryant, the Sixers were expected to lose like all of the other Lakers’ opponents in the 2001 NBA Playoffs — in four games. A sweep. No shot at competing. But Iverson had other plans, and in front of a raucous crowd in Los Angeles, Iverson stepped up (and over) his competition. Iverson clawed and scratched his way to 48 points in a 107-101 overtime victory over the Lakers. There was no shot bigger then his crossover and bucket on Tyronn Lue to give the Sixers a 103-99 lead with just 47 seconds remaining in overtime. Despite the Sixers’ eventual loss in the series 4-1, that one game showed how much heart and grit that Iverson had in him. He became a beloved figure across America. Everyone admired how much will and determination the man displayed. It’s hard to believe that the highest point of Iverson’s career is now 12 years removed from his lowest point — his retirement from the game of basketball. Five years from now, we’ll be talking about Iverson being enshrined into the NBA’s Hall of Fame as the best pound-for-pound basketball player to ever play the game. He deserves the accolades, every last one. Iverson’s finally closing the book on his career to focus on his life outside of basketball. In reality, he should and he knows this. I commend him for doing so. With every story that breaks on his bankruptcy, parenting troubles and fizzled marriage, he realized that this is the best thing for him to do. But just because Iverson is finally leaving basketball, doesn’t mean that the remnants of his game won’t still grace the basketball court in the 2013-14 NBA season. Whenever you see the Knicks’ Carmelo Anthony release a mid-range jumper in rhythm, think about Iverson’s influence. Whenever you see the Pistons’ Brandon Jennings weave between two defenders and take the ball to the rack against the tallest big man in the league, think about Iverson’s influence. And, whenever you see the Thunders’ Kevin Durant fearlessly launch a three to will his team back into a basketball game, think about Iverson’s influence. Those are just a few examples of the many that mimicked their game off of the man growing up. He’s a true hero not just to the Sixers, but to the entire game of basketball that will never be forgotten. I can’t wait for the day that the Sixers hang a No. 3 practice jersey in the rafters at the Wells Fargo Center in his honor. Jeff McMenamin is a scribe for Philadunkia. You can follow him on Twitter @Sixersblog. You can follow us on Twitter @philadunkia.